Home >> Generated from JAN's SOAR Information System on 4/26/2019 4:15:32 AM. Manually propelled one worker lift. Totally enclosed platform with 42” guardrails, mid rails, and gate. 4” toe boards and skid resistant mat. Two platform styles available: Standard platform with steel deck (BL-315), cantilevered platform with aluminum deck (BL-C14). 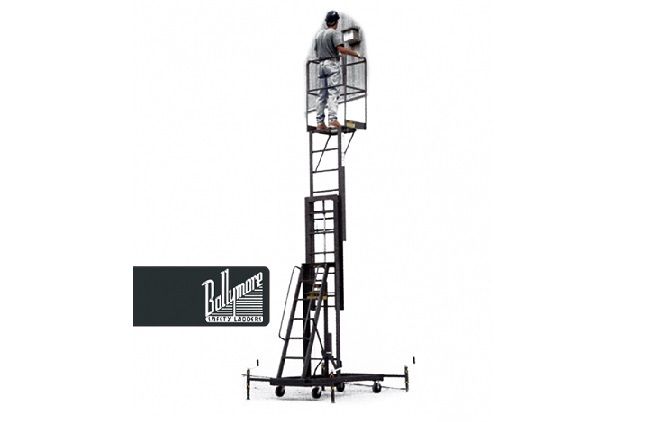 Built in ladder with flat, skid resistant treads and grab rails provides access to platform in fully lowered position, while anti-skid rungs provide access to platform when lift is raised. Compact base frame rolls on two swivel and two rigid 6” casters. Rails fold down for doorway passage and easy storage. Base is 32” wide by 65” long, outriggers extend to 68” wide. Leveling jacks secure lift to the floor. Hydraulic hand pump provides easy lifting. Also available with powder coat safety orange finish. Three available power options: Convenient plug in 120V, AC Independent 12V, DC deep cycle system complete with battery and charger.